With hours to go before the U.S. copyright office’s deadline to receive comments about the Digital Millennium Copyright Act (DMCA’s) “notice and takedown” process, digital rights group Fight for the Future and popular YouTube channel ChannelAwesome have launched an online campaign and viral video encouraging Internet users to submit comments about the many ways that the DMCA is abused to censor and take down legitimate content from the Internet, stifling innovation, cultural creation, and freedom of speech. The campaign was launched late Thursday afternoon. The video has already been viewed more than 170,000 times, and the campaign has already generated more than 50,000 comments in support of stronger fair use and free speech protections in the DMCA. 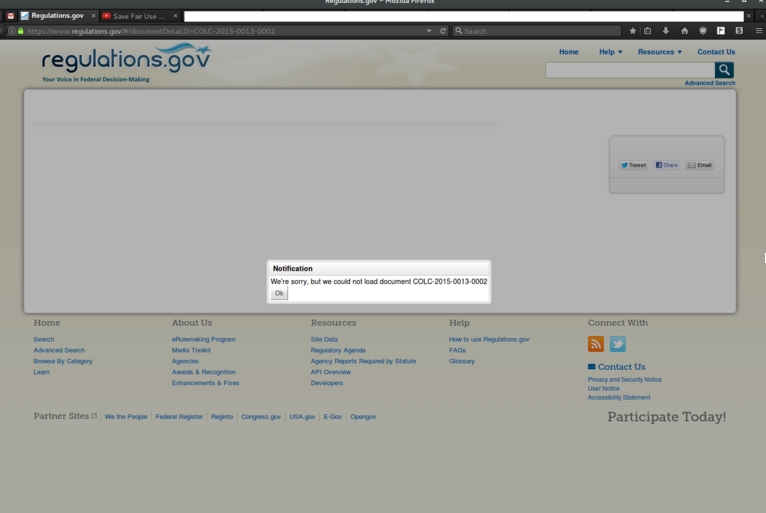 Before the launch of the campaign last night, the Copyright Office had only received 80 (yes, eighty) comments. As of March 2nd, they had only received 23. The flood of new submissions over the last several hours appears to have repeatedly crashed the website that the government set up to receive feedback. Given that this site is the only method for concerned Internet users to submit comments, Fight for the Future is calling on the Copyright Office to extend its deadline to ensure that all comments are received and there is adequate time for the public participation. The tens of thousands of comments submitted to TakedownAbuse.org are being stored in a queue, and will be submitted to the Copyright Office’s form as quickly as they can reliably receive them. “Copyright laws are among the biggest threats to freedom of expression in the digital age,” said Evan Greer, campaign director of Fight for the Future. “Taking down content from the Internet en masse doesn’t benefit artists and individual creators, it benefits large corporations. I supported my family as a musician for years before coming to Fight for the Future, and I believe creators should be compensated for their work. But the Internet is the best thing to ever happen to creative people and independent artists. We need to fight to defend it from those pushing censorship in our names,” she added. Follow Fight for the Future on Twitter for breaking updates on this campaign, and contact press@fightforthefuture.org if you’d like to schedule an interview.